A rarity in two ways: first, in the connector fitted, but second and more important, in affecting the bass in a pleasingly positive way. Good value. Silvermann is a UK-based manufacturer specialising in mains cables: the company website also lists two interconnect models. Silvermann Labs Clarity 1 is the basic model in the mains range, a shielded design using silver-plated copper conductors. It is available with the usual IEC connector, but we chose to test it fitted with a figure-8 (Telefunken) connector fitted, as this is still quite a common fitment and is rather under-supported by audiophile mains cables generally. 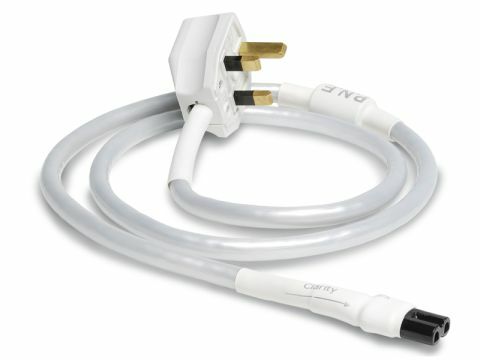 The figure-8's small dimensions don't exactly make it a natural for bulky upmarket cables, but Clarity 1 is quite modest in size as these things go and Silvermann has fitted it neatly into the connector with the aid of plenty of heat-shrink sleeve. It does need around four inches of 'bend space' behind the equipment though. A ferrite noise blocker is fitted as standard. We tested this cable mostly with a Pioneer CD recorder, a much-used device of familiar performance and were definitely favourably impressed with the performance in both recording and replay mode. Rather unusually, the result seemed to be most audible in the bass – we've heard this before from mains cables, but detail and treble seem to be more common beneficiaries. Here, we were treated to a small increase in bass resolution, which seemed to add a semitone or two of extension and increased the clarity of the lowest notes. As a result, rhythm becomes a little tighter and more involving. A quick check with a couple of other fig-8-equipped components suggested that this improvement is not unique to the Pioneer.